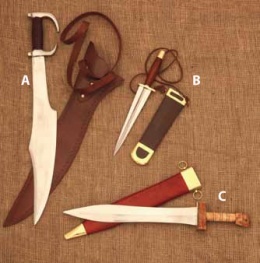 A) This fantasy Spartan dagger is based on the film "300". It has a blunt edged carbon steel blade and leather wrapped handle with brass pommel and guard. B) this classic reproduction, with it's long trianglar blade reflects the Celtic/Scottish influence in some weaponry from this period. A) inspired by the film "300"
B) A parazonium is a long triangular dagger, wide at the hilt end and coming to a point. In the Roman mythology, it is frequently carried by Virtus, particularly on early representations. It is also sometimes carried by Mars, or Roma, or the Emperor, giving them the aura of courage. Virtus on a coin holding spear and parazonium. This page was last modified on 9 July 2013, at 13:52.